Savor it while you have it and stay warm. C'est joli avec toute cette épaisseur de neige. Ginnie Hart: Meri, Martine. It's thick because it's so wet...just borderline freezing, but beautiful. We're still waiting for ours :-( This is a lovely photo - I love seeing all the grasses and shrubbery blanketed! Ginnie Hart: I know what it feels like to wait, Elizabeth, year after year. Sadly, it's now all gone. Our last real snow that stayed around for awhile was in December of 2010. Very nice. We need snow. We have none just like last year. A lovely Winter scene, Ginnie. The snow clinging to the branches always create a nice winterscape!! 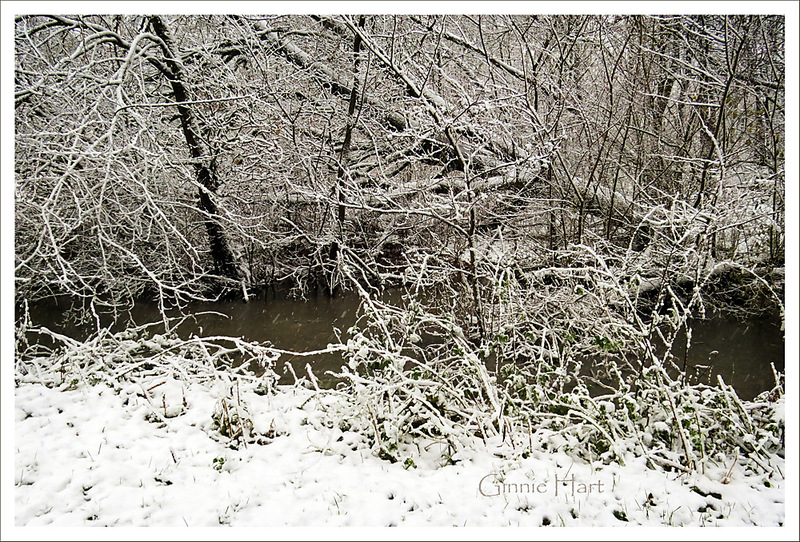 Ginnie Hart: Wet, gloppy snow, Steven, does have its own beauty, for sure. Thank you. Ginnie, a great picture to remind us of a wonderful walk in the Lingebos with son and DIL. Too bad it started raining warm water again... all gone till who know how long. Ginnie Hart: SNOW, indeed. And now it's gone. We were so fortunate to get back from our weekend trip in time to catch this in the Lingebos with Jeroen and Eva joining us. We'll never forget it. This year has been snowier than most winters in the UK - so far..
Ginnie Hart: Ours is all melted now, Chris, but I'd love to think we'll get some more later? I think the days of long cold periods when the snow would linger have long gone. On Tuesday, on a drive passings Chad's country estate, we passed through some fabulous snowy scenes with a the,operature of -6 deg; today its damp and already +6deg! Give me the former any day This is a beauty. Your winter scenes are so beautiful, Ginnie. Now all we need here in NC is the snow! Ginnie Hart: I know exactly what you mean, Larry, because ours is now all gone! Oh, what a wonderful snow picture - I recall your words about your snow walk to Lingebos - an experience you never forget! Ginnie Hart: Exactly, Philine. Thank God for the photos and the memories because our snow is now all gone. So you had your wish, although so short-lived, Ginnie! It could be here Ginnie, day six and the snow has not completely gone. Ginnie Hart: It was a good weekend, Chad...and then it all left! Tu me fais rêver avec cette belle ambiance hivernale. Ginnie Hart: It lasted only 4 days, Pascale, and now it's gone. But at least we had a taste of it again. what beauty!! when snow covers the naked branches of a tree! I used to get so excited when i woke up to a sight like this! thanks for sharing!! Ginnie Hart: I know exactly what you mean, Elaine. I have so many wonderful memories of snow and blizzards from my youth. Those were the days! Thank you. Looks good, I would say. Tomorrow my daughter and her hubby flies to A'dam to visit the in-laws - her aunts, uncles and cousins. Having some snow would be an event to them. Une belle couche de neige! Ginnie Hart: It was beautiful while it lasted, Anne! Ha ha....ook doorkijkje tussen de mooi besneeuwde takken. Ginnie Hart: We were lucky to have at least one or two days, Marjolein! It is a fine snow picture Ginnie but personally I'd just rather we didn't have to have it. Ginnie Hart: I'm afraid I look forward to snow every year, Brian, and am disappointed if we don't get it. Gotta make myself a good ice kacang. Ginnie Hart: I wish I could have saved some for you, LC. Next time call me. We had ours less than 24 hours but it was indeed a beautiful sight. Ginnie Hart: It was indeed beautiful while it lasted, Mary! He he... It's me again! Actually, we had some snow in London earlier this week. Alas, less than an inch of it. But it was just enough for me to build a nano snowman. Ginnie Hart: HAHAHA! Good for you, LC. Please tell me you took a photo of it??!! And if so, I want to see it. Ginnie Hart: It was beautiful while it lasted, Bill. Maybe it'll happen again? Ginnie Hart: I would expect nothing less from your part of the world, Peter! Lucky you. i love it, Ginnie. i can almost hear the crunch of the snow underfoot! Ginnie Hart: Exactly, Ayush, and thank you!